A surge in tourism and tax revenue from hotel stays and new airline servce are raising desert spirits. PALM SPRINGS, Calif. (MainStreet) -- California's desert communities have been among the hardest hit in the nation with declining real estate prices and foreclosures, and it's been startling to once buoyant communities such as Palm Springs. Long a favored escape for Hollywood luminaries and retired CEOs, the city's downtown is stained by a mall that's been mostly shuttered for more than a decade and empty storefronts extending from border to border. But there seems to be light at the end of the tunnel -- a surge in tourism; tax revenue from hotel stays up 17.7% from 2010 to 2011; and new airline routes by Virgin America connecting the city with New York and San Francisco. The Saguaro Palm Springs is a former Holiday Inn now ablaze in colorful southwestern colors and a boutique vibe that's like a hipster tribute to Georgia O'Keefe. High season in Palm Springs seems to get longer with each passing year, beginning with this month's Palm Springs International Film Festival (this year attracting the likes of Brad Pitt, Angelina Jolie and George Clooney). In February, the city hosts its annual Modernism Week, celebrating the wondrous architecture of the desert with works by Albert Frey, A. Quincy Jones and William F. Cody. And in April there's the Coachella Valley Music and Arts Festival, one of the biggest and most profitable outdoor concerts in the country. This year it extends over two weekends this year from April 13-22 and brings performances by Radiohead, Florence + the Machine and David Guetta. Bohemian spirits in search of eternal sunshine and a less hurried urban life have always been at the root of desert migration, and those dreaming of a different life fuel many of the city's burgeoning businesses -- quirky cantinas, mid-century antique shops, lively bars and restaurants that may or may not last even a season. Cheeky's Restaurant has proven one of the city's tastier success stories and become an eatery known for innovative breakfasts and feel-good foodie lunches. Last year, the restaurant added a pizza eatery called Birba next door, and this year the company has expanded to include the Alcazar Hotel. Alcazar Hotel sits just west of the city's downtown stretch, on the edge of the Palm Springs design district amid stylish antique stores, clothiers and art galleries. Once known as the Peppertree Hotel, the new Alcazar shows off an extensive remodel, including arty iron gates and terra cotta-topped one- and two-story bungalows. There's a single-room reception with friendly service ready to explain how to access the property's two affiliated eateries. A pool at the center of the property takes full advantage of a mountainous skyline, although there's a bit of traffic noise that just a little music could camouflage. Most of the 34 rooms are spare, all-white spaces where premium linens and artisanal bath products put a lux spin of the usual boutique hotel amenities. Another new hotel concept comes in South Palm Springs, where the Desert Riviera occupies a revamped 11-room motel meticulously preserved in mid-century details and embellished in period antique finds. You won't find dogs or hipsters smoking to the beat of electro-rock anthems here; its Oregonian owners maintain a cozier aesthetic of preening pool and evening firepit where guests gather with goblets of Pinot or take to the local neighborhood on complimentary beach cruisers. Rooms mix colorful retro decor with period bathrooms a la I Love Lucy and in-room kitchenettes. The hotel is a secluded reprieve from hot spots such as the Ace Hotel that appeal to a louder, brasher weekend demographic. 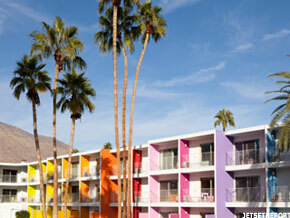 The Saguaro Palm Springs opens Feb 1. An expansive resort walking distance from the Ace opens within a former Holiday Inn, now ablaze in colorful southwestern colors and a boutique vibe that's like a hipster tribute to Georgia O'Keefe. This is the sophomore edition of The Saguaro brand after Scottsdale, Ariz., all owned by the Sydell Group -- the same development group that own Ace Hotels as well as the soon-to-open NoMad Hotel, also in New York. The Palm Springs and Scottsdale installments of The Saguaro (named after the famous Sonoran desert cactus) are managed by San Francisco-based Joie de Vivre. Built in the late '70s, The Saguaro Palm Springs will likely extend the weekend party scene started at the Ace Hotel to its courtyard resort deck and pool. The design overhaul comes via architects Peter Stamberg and Paul Aferiat of New York-based Stamberg Aferiat Architecture, who use a palette of 12 colors inspired by indigenous desert flowers for exteriors as well as the 249 guest rooms. Lovers of the Ace should expect a similarly playful hotel experience, likely to be the it hotel of the season with its two eateries by Iron Chef star Jose Garces, a James Beard Award winner. Forthcoming Tinto restaurant will offer a Basque-influenced eatery and tapas lounge, while El Jefe will create a small-plates lounge experience inspired by the cuisine of Mexico City. As for other developments around Palm Springs, chatter regarding a Mondrian Hotel next to the city's refurbished convention center continues, although the project is still in the early stages of planning since being delayed in the real estate downtown. And as for that empty mall in the city's downtown core, voters approved a 1% increase to the city's sales tax that will be allocated to buying parts of the mostly vacant project for redevelopment -- hopefully just in time for better economic times in California's most famous desert community.